I heard a lot of buzz last year about the Nokia 770 being the cheap Linux geek’s gadget of choice, and I wanted in on that action to replace my increasingly obsolete Palm Z22, so I bid for a like-new secondhand 770 on eBay and won it for $102.50 — pretty good bargain. 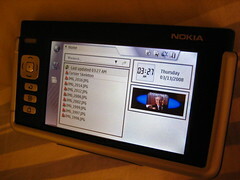 Take note: the 770 is not a phone, but an internet appliance which Nokia released to test the market for such a device. 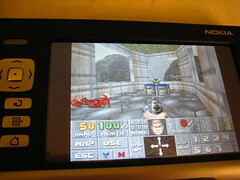 It’s basically a handheld Linux computer with a 252Mhz TI OMAP CPU and 64MB RAM, running Debian and a mobile build of Opera, with open-source support through Maemo.org (a community sponsored by Nokia). 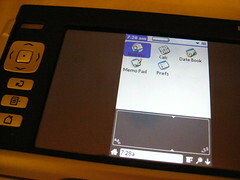 Interface is touchscreen-based, drag-to-scroll, with buttons along the top of the device and left of the screen for additional functions: power, fullscreen toggle, a rocker to control volume or zoom, a D-pad for movement and scrolling (though touchscreen dragging is much easier for that), a menu toggle, and an escape key. Text input is done either through handwriting with the included stylus (difficult and unintuitive) or by an onscreen thumb keyboard (easier) which can expand to fullscreen. 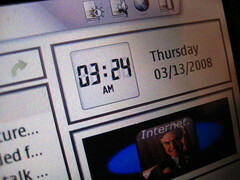 The desktop can be customized with a background wallpaper and a limited selection of draggable “applets” — clock, radio, google or wikipedia search, RSS reader, single-link graphical bookmark, and contacts. PIM functionality is sadly lacking, with only a barebones Contacts application just for email addresses and Google Talk contacts; no real address book, no calendar, no tasks, but there is at least a rudimentary notes application which saves text files to the filesystem. Additional third-party apps are freely available from Maemo.org’s download archive, but I’ve found none are satisfactory for PIM use; and many apps (at least in the OS 2006 section) fall short on stability or usability out of the box, needing endless tweaking and customization to work properly, as with much open source software out there. While it’s fun to be able to play Doom on a 770, it’s not quite as fun when you find it crashes when you try to load a saved game, and the instructions to install the latest build read a lot like the Quake 3 Linux Troll. At the end of it all, the 770 excels at web browsing with wifi or GPRS via bluetooth, but for most other functions (personal information management, games, ebook reading, notetaking) I’ve found a basic Palm device to be superior. Now, this is where Garnet VM comes in handy: it’s a Palm emulator for Nokia tablets, creating a virtual Palm OS environment wrapped in a simple 770 launcher application, with the ability to install new Palm applications from the filesystem and even HotSync with a PC given its hostname or network IP. Oh, one small problem since I started using Garnet VM: it appears that a small dead spot has appeared on my 770’s touchscreen corresponding to the position of the writing area — that part of the screen still displays stuff, but it no longer responds to touch. I’m a vigorous Graffiti thumbnail writer, and my Palm’s been able to take it, but it seems the 770 screen may not have been quite so durable. So caveat emptor on that.